The upcoming Thanksgiving holiday has me thinking about foods that bring me back to my childhood. 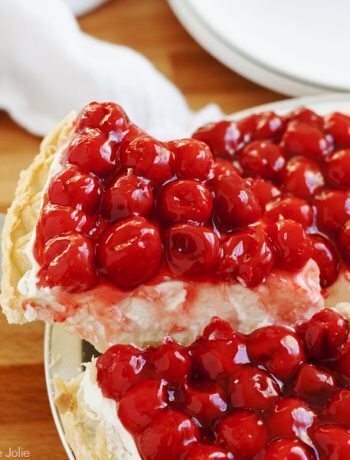 Some of these are family driven like the Baked Artichokes that I posted earlier this week and Rosie’s Award Winning Cherry Cheese Pie. Others are those quintessential childhood foods. The ones that are so beloved in our American culture that even the smell of them is enough to transport us back to that happy, carefree place of our childhood. Like to your mom’s kitchen table, biting into to your PB&J for a quick lunch, before heading back out to continue playing until your mom calls you in for dinner. Or getting off the bus and coming in to be greeted with the smell of freshly baked brownies for a glorious after school snack. These bring back the happiest of food memories. They will always have a happy place in my heart and my diet! So combining them into a rich, decadent dessert for the holidays is a natural next step. 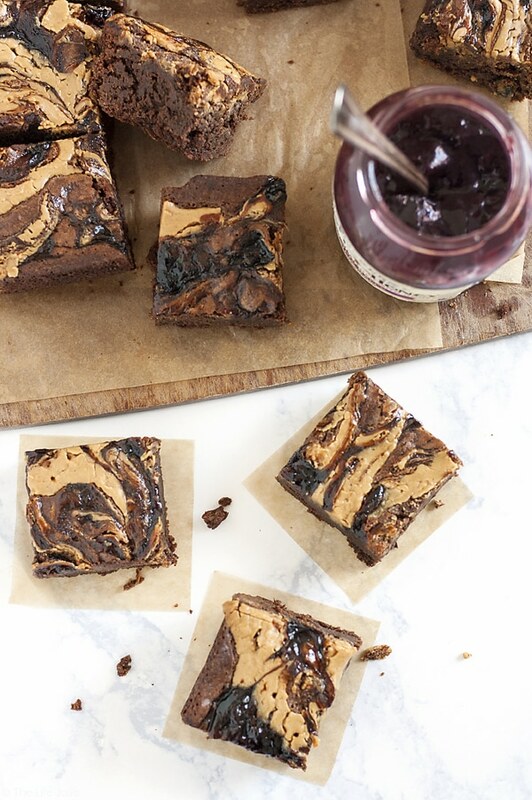 I had actually been planning to post the recipe for these brownies for a while when an opportunity became available to collaborate with and feature Smucker’s Fruit & Honey Fruit Spreads. I come from a long line of very loyal Smucker’s fans. Their many varieties of spreads have played a leading role in various meals and snacks throughout my childhood and now in my own family’s life. Interestingly, I had been in such a habit of getting my favorite Smucker’s Seedless Blackberry Jam, that I hadn’t even realized these Fruit and Honey Spreads existed. Boy, have I been missing out!! First of all, they’re sweetened naturally with honey. And I gotta tell you, this allows the true flavors of the fruit to really shine through while still maintaining the subtle sweetness of the honey. 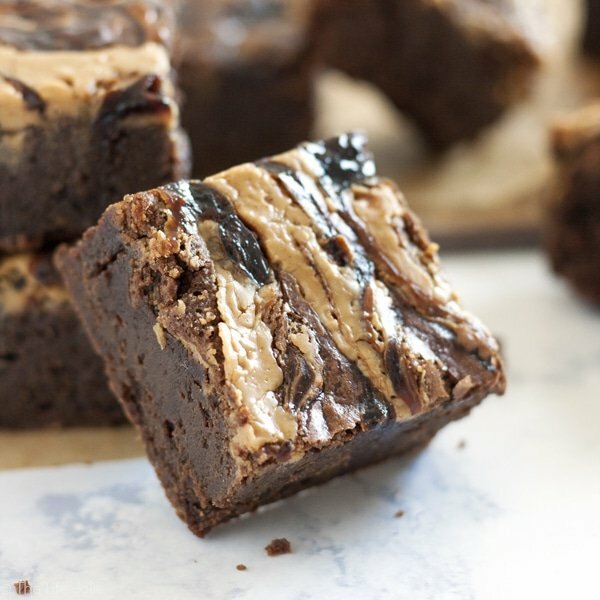 It also makes a texture that is the best possible consistency to smear on a piece of bread or to (ahem) swirl with peanut butter on top of a pan full of deliciously chocolaty brownie batter. There were so many different sweet and savory ideas that came to me when I started thinking up recipe ideas for the spreads. I’m a sucker for a quick and simple meal solution and these spreads have potential far beyond your morning toast. But being that it’s November, my brain is living in a constant state of Thanksgiving Brainstorming. I can’t help it you guys, it’s one of the biggest eating holidays of the year. I’m getting hungry just thinking about it! I’m also a huge proponent of having a variety of different desserts available on Thanksgiving. Although I love pie, I am thankful for a holiday where I can eat all the things. 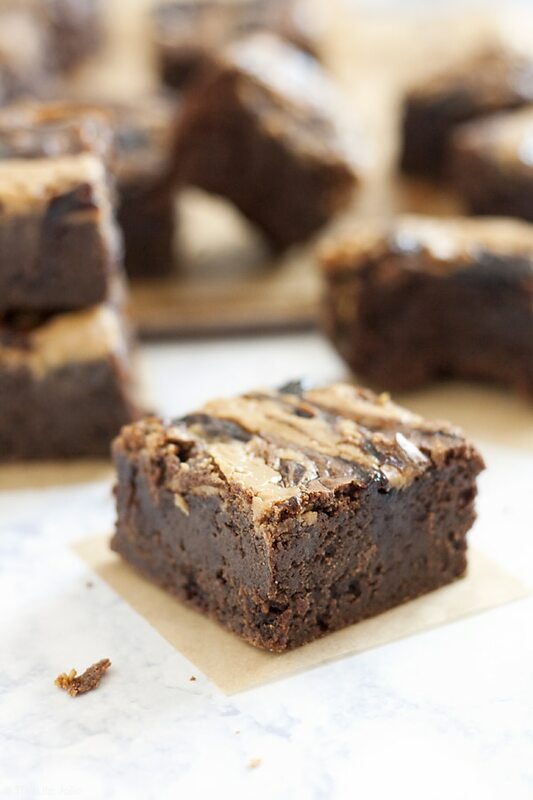 Those things should absolutely include PB&J Brownies (see what I did there?). Think about it. 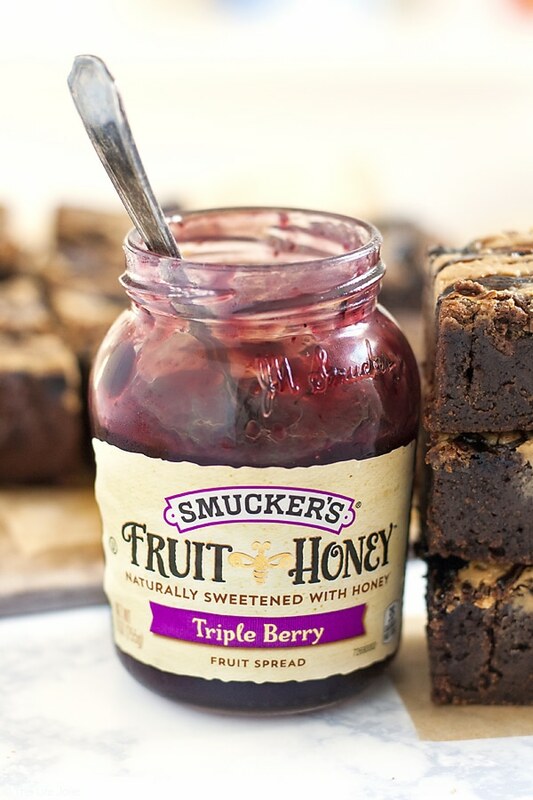 Rich, fudgy brownies swirled with creamy peanut butter and Smucker’s Fruit & Honey Triple Berry Fruit Spread. It’s two comforting childhood standby’s baked into one amazingly decadent dessert that the whole family will love. And it looks so pretty, it will be such a festive addition to any holiday dessert table. 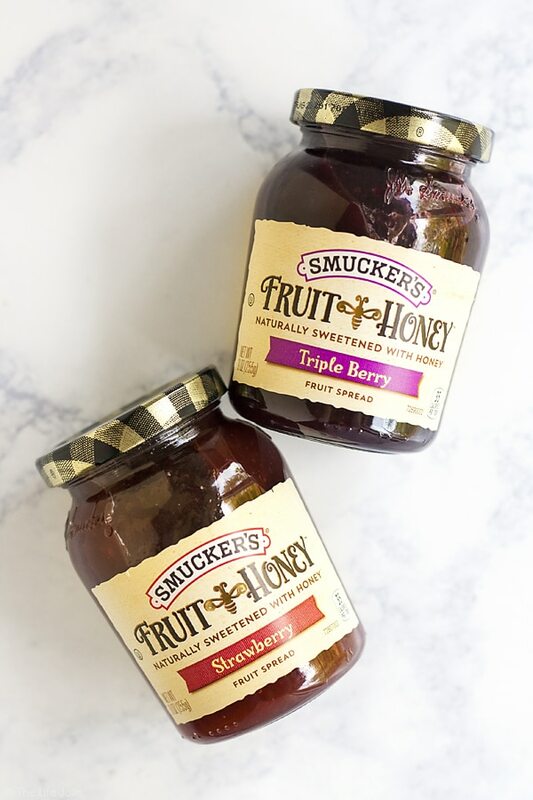 TL:DR: Smucker’s Fruit & Honey Fruit Spreads are an excellent option for easy holiday entertaining. You should really make these amazing PB&J Brownies for Thanksgiving or Christmas or Hanukkah or just because you deserve a brownie (you really do!). I opted to use the Triple Berry Fruit Spread in this recipe. 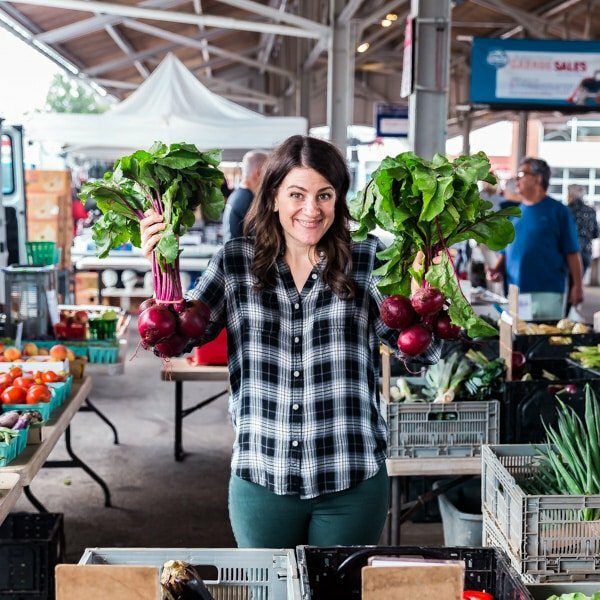 But they would be pretty incredible with any of the five varieties that are available like Strawberry, Blueberry Lemon, Concord Grape, or if you’re feeling spicy, Strawberry Jalapeno! 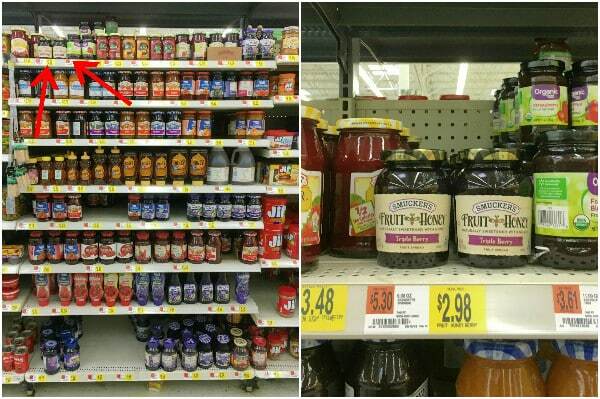 They’re conveniently located with Smucker’s other great products at your local Walmart. 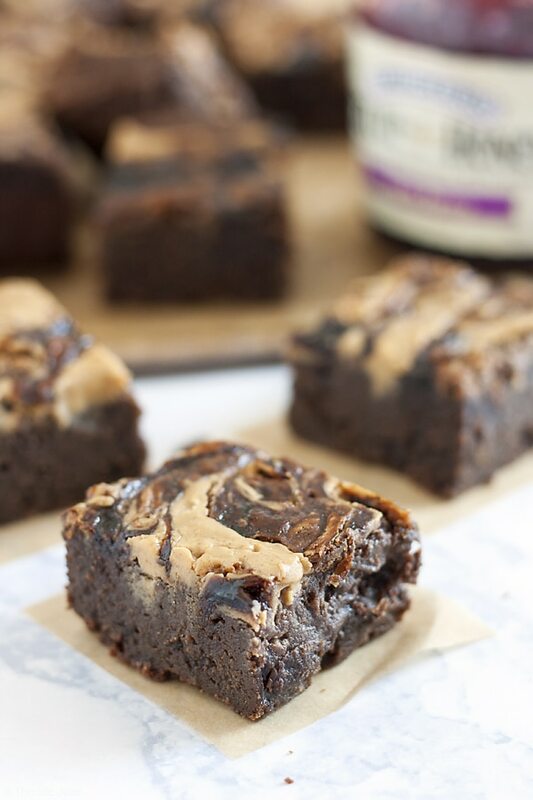 These homemade PB&J Brownies are an easy and delicious holiday dessert option. 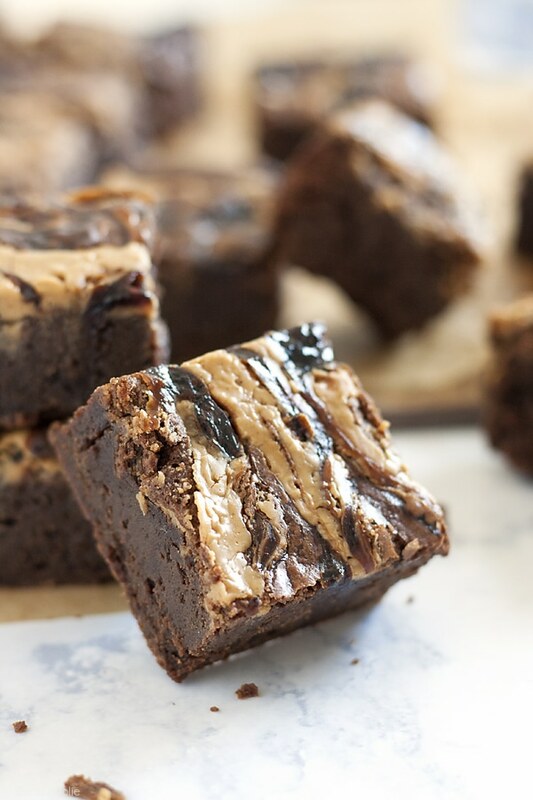 Chewy, fudgey chocolate brownies with a swirl of peanut butter and the fruit spread of your choice on top, these are made from scratch and would be great on a Thanksgiving of Christmas dessert table or just because you deserve a tasty dessert! Grease an 8x8 pan, line it with enough parchment paper that extra comes up over the sides (for easy removal) and then grease the parchment paper and set aside. Melt your chocolate and butter in a large, microwave safe bowl. 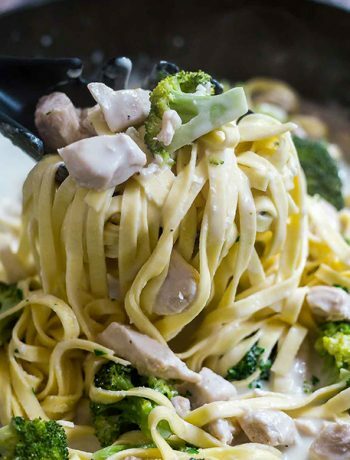 The lazy-girl's way of doing this is by microwaving it for 30 seconds, stirring, microwaving for 30 seconds more, stirring again and then continuing to microwave in 15 second increments and stirring between until it's fully melted. Once it's fully melted and liquidy, whisk in your sugar. Next, whisk in each egg followed by your vanilla extract and salt until well combined.Stir in 1 cup of flour with a spoon until it's fully combined (try not to over mix it!). Pour your batter into your pan and use a spatula to spread it evenly. warm your peanut butter and your fruit spread for around 20-30 seconds each to soften them a bit. Add 3 rows of spoonfuls of the peanut butter and the fruit spread, alternating them (mine had peanut butter in each corner and in the middle and then the fruit spread in between each dollop of peanut butter- it kind of looked like a tic-tac-toe board). Using a knife, swirl the peanut butter and fruit spread together. I try not to over-swirl for the prettiest marbling, but also go out of my way to make sure the peanut butter and fruit spread is evenly distributed. Bake for 50-60 minutes, or until your tester comes out (you want to get it to the point where it's not gooey batter on the tester but the crumbs are just starting to stick to the tester). Try to let it col completely (brownies tend to do a lot of crossover cooking) and then use the parchment to remove the brownies in once piece and cut them. 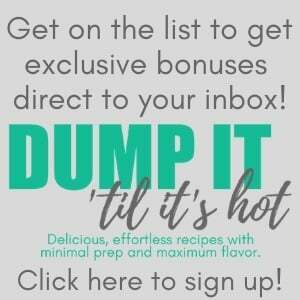 November 12, 2016 at 8:16 pm Me too- I'm dying to try the Strawberry Jalapeno! My daughter couldn't get enough of the brownies!! November 12, 2016 at 8:15 pm Thank you, April- definitely give the Spreads a try (and the brownies! )- they're fantastic! November 12, 2016 at 8:12 pm Thanks HannahI got super excited when the idea came to me (my husband was skeptical...until he tasted them- he instantly became a believer). November 12, 2016 at 8:11 pm Thank you, Amanda! Your great-grandmother sounds like a smart woman! November 10, 2016 at 5:12 pm Oh my yes!!! 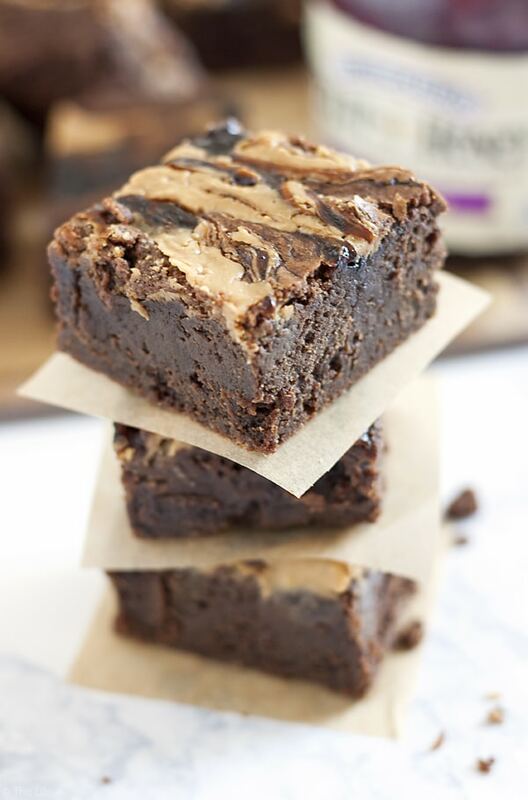 I love the creative idea to add PB&J to the chocolate brownies. Genius! I've been wanting to try that new Smucker's brand, btw. I saw a blueberry and lemon flavor that sounded perfect for spreading on muffins or scones. Yummm! Thanks for sharing! November 12, 2016 at 8:09 pm Thanks Sharon! The new Fruit and Honey Spreads from Smucker's are seriously amazing. 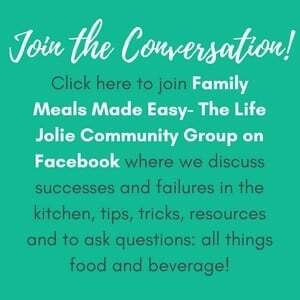 I have so many great recipe ideas for them but my family can't seem to keep a full jar around because we all love it so much! Seriously fantastic flavor! November 12, 2016 at 8:07 pm Thank you, Cricket! 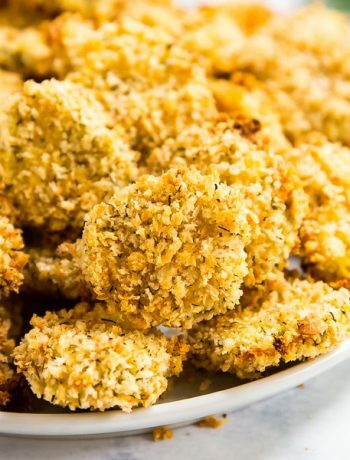 Please let me know how they are when you make the GF- my cousin is GF and I'm always looking for great GF options to make for her (although I'm no expert on GF baking so I usually search out other blogs- I'll have to check yours out!). November 12, 2016 at 8:05 pm Thanks Gloria! It's definitely a great combo of childhood favorites (perfect for the holidays! ).